Alopecia is lack of hair following accelerated abnormal hair loss (alopecia). Normal hair loss is 50 to 100 hairs per day. Alopecia develops when a person loses more than 100 hairs per day over a long period of time. As a person has approximately 100,000 hairs, the number of hairs on the scalp declines gradually. Some areas of the scalp are more affected than others (crown of the scalp, temporal areas) although alopecia can also lead to uniform hair loss. There are several forms and therefore several causes of alopecia. The most common form is androgenic alopecia. This is hereditary and mostly affects men (70%, sometimes even young people). Acute alopecia is due to physiological stress (chemotherapy, nutritional deficiencies, iron deficiency, hormone problems, acute irradiation, etc.). Localised alopecia is caused by local skin problems (scarring, tumour, burn, parasites). Congenital alopecia is an absence of hair from birth. 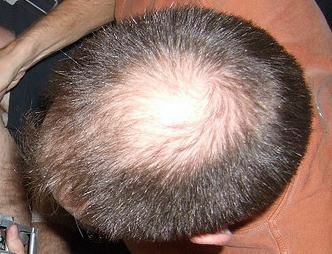 Localised auto-immune alopecia (alopecia areata) occurs over the whole scalp (alopecia totalis) or over the whole body (alopecia universalis). Hormonal treatments can slow hairloss although there is not yet an effective treatment to make hair regrow. However, hair implants are possible although the technique is expensive.